"When we stepped out of the air conditioned car we instantly started sweating in the 35 degree heat. Sunny lead us to the first part of the tour where we sat in a dug out underground hut to watch a short clip about the war and how the tunnels were used to hide from the Americans (the enemy). The tunnels are dug deep under ground with multiple levels and routes. They lead to underground rooms which are laid out side by side, one room for a meeting area, the second for the hospital, the third for the kitchen and the fourth for supplies such as food, water and ammunition. A tunnel would also lead to a river or another escaping area." Cu Chi - is a suburb of Ho Chi Minh City is about 40 km away. 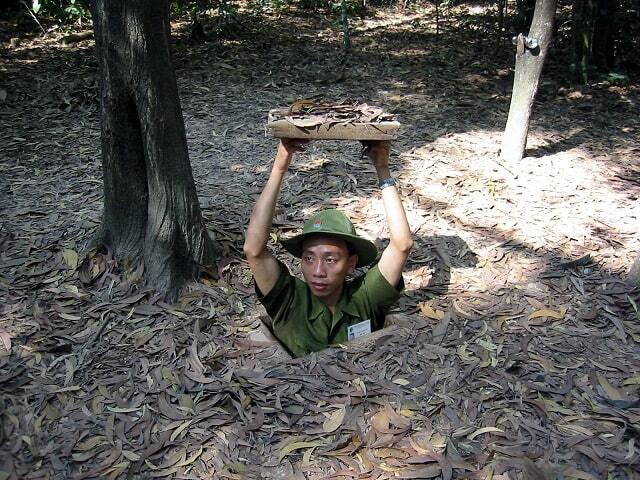 The Cu Chi Tunnels are a vast underground complex, consisting of 250 km of tunnels and spaces exist under the city. The tunnels were dug with simple tools and bare hands during the French occupation in the 1940s and expanded during the Vietnam War in the 1960s. The underground passages offered protection against American soldiers, despite all the bombings in their city. The people of Cu Chi were able to continue their lives under the ground, where they slept, ate, planned attacks, healed the sick, and teached the children. Some even married and children were born. But ...... more than 10,000 lost their lives. 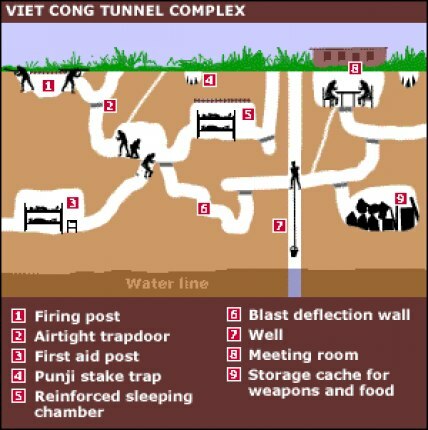 There are at Cu Chi two places where you can go underground: Ben Duoc and Ben Dinh. The difference between Ben Dinh and Ben Duoc is that the Ben Dinh tunnels are specially made for tourists and they were never really part of the tunnel network. The reason that one chooses Ben Dinh is that most tourists are slightly larger than the average Vietnamese. To Ben Duoc are all Vietnamese locals going. It is also slightly further away from Ho Chi Minh City compared to Ben Dinh, but Ben Duoc did make part of the tunnel network . If your staying in Ho Chi Minh City and you walk around the town, you'll see a lot of travel agency which organize a half day trip to the tunnel complex. The guides would sometimes try to hurry you. Just tell the guide that you're not ready with taking photo's. Take your time and don't rush. The half day tour departs at 8:00 pm and is back at 14:00 in Ho Chi Minh City. You'll be dropped off at the travel agency where you left, or at the War Remnants Museum. That is not far from the center and perhaps a great opportunity to visit the museum. Ben Duoc further away from Ho Chi Minh City, maybe about 30 minutes extra travel time. Since most tours go to Ben Dinh, this place is rarely crowded, but you have to arrange a driver. This "private tour" will cost $ 45- $ 75 for a half day with driver. Prices depend on the size of the vehicle. You can also rent a bike if you do not plan to use public transportation. The property is accessible by bus 13 and 79. Bus 79 stops at the entrance of the hall complex. The ride from the centre of HCMC takes by car about 1.5 - 2 hours depending on the traffic. The tunnel tour takes about 45-60 minutes. The Ben Duoc Temple is also part tour. These can be visited separately. There are attractive restaurants by the river. There are four separate tunnels to crawl through, and there are examples of underground sleeping quarters, medical and command posts. The tunnels are the original tunnels, the entrance is reinforced for the safety. 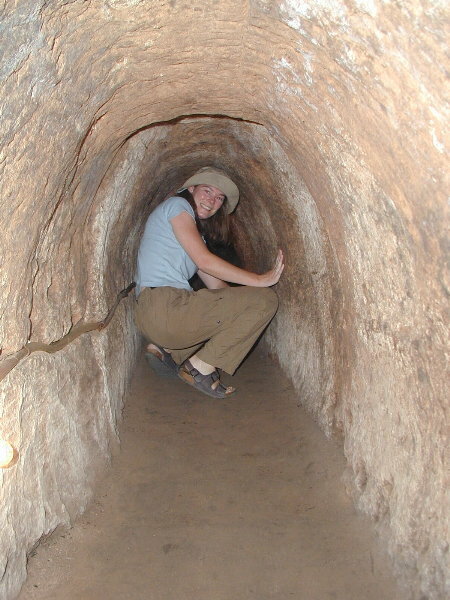 The tunnels are quite narrow and low. The guides will not let you in, if you are unfit or too large. The ticket office also features two Vietcong fighters. Bring insect repellent with, if you want to see the movie in the barn, because there are many mosquitoes in the surrounding jungle. Ben Dinh is the most touristic tunnel complex and you'll be in good company, because this is the place where most tours go. It can be very busy. Realize, however, that this tunnel complex specially created and enlarged for tourists. These tunnels were never part of the actual network, as stated in Ben Duoc. Bring a mosquito repellent and also keep in mind that there may be bats in some tunnels. They are resting or sleeping, so if you are bitten or scratched by a bat, you need to get to a hospital because bats can be carriers of rabies.